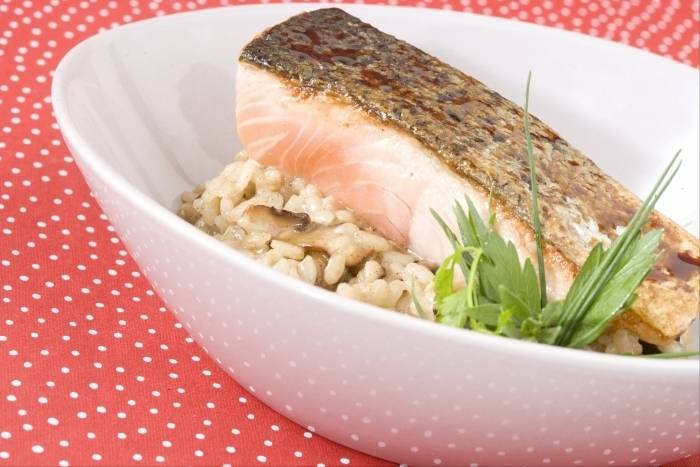 Pan-fried salmon with a honey and soy glaze served with a mushroom risotto. For the risotto: peel and finely dice the onion and the shallot. Chop the parsley. Finely slice the button mushrooms and tear the oyster mushrooms into small pieces. Heat a saucepan, add a dash of olive oil and then fry the mushrooms until golden brown. Add the shallot, cook for 1 minute and then stir in the parsley. Season to taste and set aside. Dissolve the chicken stock cube in the hot water. Grate the parmesan. Heat a saucepan, add a dash of olive oil and sweat the onion until soft. Add the rice and cook until the grains of rice are translucent. Add the white wine and reduce. Once the wine has been absorbed, add a ladleful of stock, stir until all the liquid has been absorbed. Repeat this process until the rice is cooked - this should take approximately 15 minutes. Mix the cooked mushrooms into the rice and remove from the heat. For the salmon: season the salmon with fleur de sel and a few pinches of piment d'Espelette. Heat a non-stick frying pan and add a dash of olive oil. Place the salmon in the pan skin side down and cook for a couple of minutes. Cook each side of the salmon for 1 minute more, reduce the heat and then add the soy sauce, balsamic vinegar and honey to the pan. Coat the fish with this glaze. To finish: add a knob of butter and the grated parmesan to the risotto. Check the seasoning and serve with the salmon on top.